There's a dark side to working the graveyard shift. Millions of people around the world work nights. They clean offices, drive cabs, respond to emergencies, care for the sick and elderly and increasingly, trade stocks and shares, provide IT support and answer calls from customers and clients in other timezones. About 15 million Americans work night shifts. In the United Kingdom, it’s more than three million – or 11.7% of the workforce. Working nights can impact relationships, social lives and, of course, sleep. But even more worrying is the toll that the graveyard shift has on health. In 2014, scientists at the Surrey Sleep Research Centre (SSRC) in the UK discovered that working nights affects us at the molecular level. The research took a small group of people and changed their sleep-wake pattern to that of a night shift worker. Blood tests revealed that around 6% of our genes are timed to be more or less active at specific times. Once participants shifted to night work, this genetic precision was reduced to 1%. Regular night shift work can also lead to chronic sleep deprivation, in which a person is never able to catch up on the sleep they need, says the National Sleep Foundation (NSF). The NSF recommends between seven and nine hours sleep per 24 hours. However, those who work unsociable hours often only get between four and five hours sleep. 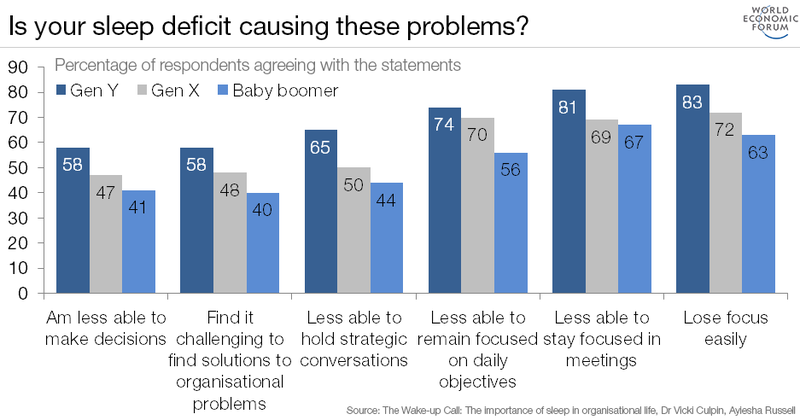 A survey by the American Academy of Sleep Science revealed that the older we get, the less sleep we have, with Generation Y (aged 20-34) getting six hours and 48 minutes of sleep on average, Generation X (aged 35-49) six hours and 25 minutes, and Baby Boomers (aged over 50) just six hours and 18 minutes. This lack of sleep can result in difficulty concentrating, which can heighten the risk of injury. The NSF says slower reaction times and more errors typically occur during night hours. What’s more, investigations by the Scandinavian Journal of Work, Environment & Health, which analysed multiple shift work injuries between 1996 and 2006, found those who work nights appear to have a higher risk of injury. Sleep deprivation may even cause depression, NSF warns. Indeed, a study published by the National Center for Biotechnology Information found evidence to suggest working nights increases the risk of depression. Working nights may also increase the risk of cancer. This is particularly acute among women, some research suggests. A study published by the American Association for Cancer Research in January, which examined more than 60 pieces of research, concluded that for every five years of night shift work, the risk of developing breast cancer among women increases by around 3.3%. However, a similar study argues working nights has “little or no effect” on a women’s breast cancer risk. Heart disease is another concern. Through a study published in 2016, the American Heart Association (AHA) found that insufficient sleep and sleep-cycle disruption can impair the body’s natural rhythms and cardiovascular function. The AHA says this may explain the increased cardiovascular risks observed in shift workers. While these examples are by no means exhaustive, there are a variety of ways to help reduce the health risks associated with night work. Following a study by the Institution of Occupational Safety and Health (IOSH) into the effects of shift work on health, the organization compiled an extensive list of tips for employers and employees. For example, night shift workers are advised to restrict their energy intake between midnight and 6am, instead eating at the beginning and end of a shift. They are also urged to establish a sleep schedule to facilitate sleeping during the day. More generally, employees are advised to avoid caffeine, alcohol and large meals before going to sleep. One of the top tips for employers is to ensure they are evaluating potential problems via regular health checks. The IOSH advises these checks become more frequent for those aged 40 and over, and in those who have been shift workers for 10 years or more.